Add wakame and water to a small saucepan or pot (5-6 inches diameter). Cover and heat on medium a few minutes until the wakame has expanded from absorbing the water. 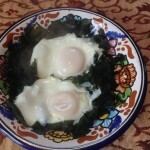 Turn to medium-low and crack the eggs on top of the wakame, replacing the cover. Cook a few minutes—depending on how done you like your eggs. While the eggs are cooking, spread the miso around the inside of the bowl you will be eating out of, and slice your butter into small slivers that will melt easily. Remove the eggs and wakame with a slotted spoon and add to the prepared bowl. Place the butter on top to melt and stir around the edges of the bowl to incorporate the miso into the dish.